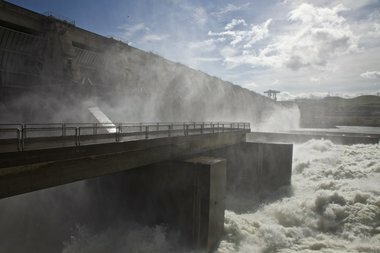 U.S. District Judge James Redden, recently interviewed on the federal Columbia River Power System case he stepped down from last fall, said he thinks the four lower Snake River dams need to be breached to help salmon. Public responses varied; some claimed Redden had "revealed" a biased environmentalism. Nonsense. Redden always did the job he was required to do as the law demanded: finding facts, applying existing law to those facts and making decisions within his power. That's why he enjoyed a perfect record of being affirmed on appeal. It felt good to hear Redden's assessment. It reflects a common-sense reality that others -- including the government, at times -- have sought to suspend or silence. The Nez Perce Tribe's goal is to restore Columbia and Snake river salmon runs to healthy, harvestable levels. Supported by concurring science extending back more than a decade, the tribe has been a leading advocate for breaching the lower Snake dams and investing in any affected local communities. More natural migration to and from the extraordinary salmon habitat of the Clearwater and Salmon rivers of Idaho would do more to restore salmon and steelhead than any other measure. Redden's comments reminded the tribe how much it respected his integrity and fearlessness. The FCRPS case over time became the most politicized litigation in the Northwest. No Indian tribe enjoys putting its legal interests at stake in a non-Indian court, where its culture, perspective and treaty-based rights may not be fully understood. Judges like Redden, acting with independence given to them by the U.S. Constitution, provide a measure of confidence that decisions won't be based on political calculation or power, but on the requirements of existing law. Redden's courage was evident throughout 10 years of handling an extraordinarily complex lawsuit with unwavering independence and care. Where to now? Redden left the parties with a transparent choice. If the federal agencies maintain the status quo, litigation will inevitably resume in 2014, again focused on the law and the science. But new factors have arisen and can play important roles in taking a broader, long-term, strategic approach. The Northwest power grid, for example, has serious source-integration problems. Wind power alone is creating power surpluses that rebut the false dilemma of those who say the lower Snake dams provide critical power. They do not. A regional solutions table focused comprehensively on the Columbia watershed, on long-range planning across state boundaries, could find that the immediate needs of imperiled salmon lead one to a broader strategic plan for the Northwest that addresses fish, power, transportation and other economic, environmental and even cultural needs with a rationality that is missing from the inherited status quo. Energy industries should see their interests at stake at such a table. Oregon Gov. John Kitzhaber, long an advocate for salmon restoration, should also. Elsewhere he is looking at strategic economic and energy issues that should draw him to the possibilities of such a table, perhaps even to its leadership. There are always different ways forward. One thing is certain: The Nez Perce Tribe intends to do all it can for the salmon that have been with our people since time immemorial. Qe'ciyeew'yew' (thank you). Brooklyn Baptiste is chairman of the Nez Perce Tribal Executive Committee.